Educational Qualification : SSC or any other examination recognized by the State Government as being equivalent to SSC and must possess an Industrial Training institutional Certificate in Wiremen OR Mechanic Motor Vehicle OR Mechanic Diesel OR Fitter or Intermediate examination or any other examination recognized as its equivalent by the State Board of Intermediate Education. Application Fee: Candidates have to pay Rs. 300/- for OCs/ BCs & Rs. 150/- for SCs/ STs towards Applications Processing & Examination through Mee Seva (e-Seva)/ AP Online/ TS Online in favour of Chairman, State Level Police Recruitment Board, Andhra Pradesh. 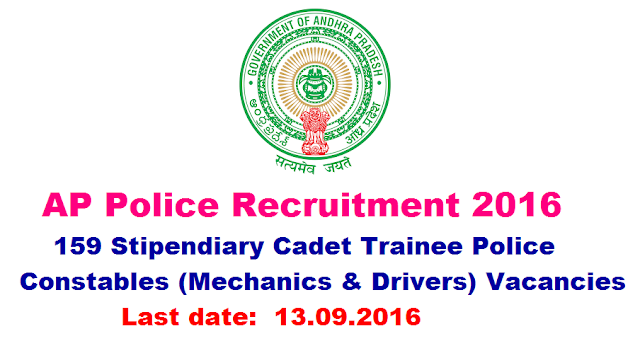 How to Apply AP Police Vacancy : Interested Candidates may apply Online through the website recruitment.appolice.gov.in from 13.09.2016 to 13.10.2016.